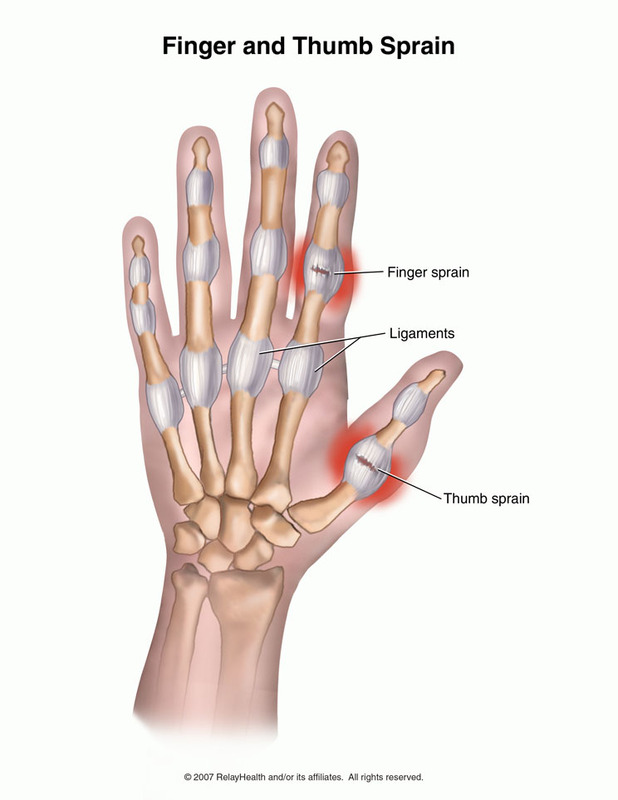 Many activities can pull the thumb suddenly away from the rest of the hand, stretching or occasionally tearing this ligament. The injury is very prevalent among skiers and is often referred to as skier’s thumb, though repetitive activities that gradually wear and irritate the ulnar collateral ligament can produce a chronic form of injury. A thumb sprain involves a fibrous band of tissue lying on either side of the thumb, known as the ulnar collateral ligament. The ulnar collateral ligament connects the metacarpal bone to the first phalanx at the base of the thumb (the thumb has two phalanges). Its function is to prevent the thumb from stretching too far away from the hand The ligament is required for pinching and grasping activities. Thumb being jammed into another player, piece of equipment or the ground. Repetitive wear of the ulnar collateral ligament through gripping between the thumb and index finger. Any activity that violently separates the thumb from the rest of the hand, such as a skiing fall. Local pain and swelling over the torn ligament. Difficulty grasping objects or holding them firmly. Instability of the thumb which may repeatedly catch on objects or clothing. If a torn ulnar collateral ligament is left untreated, it may result in a painful, unstable thumb with loss of mobility. Continued soreness and a propensity for re-injury are also possible. Buddy taping the thumb to its neighbouring digit, especially during contact sports, may help prevent re-injury. Gradual use of motion exercises to restore thumb movement should be undertaken as the ulnar collateral ligament undergoes final repair. Non-contact sports may usually be permitted six weeks following the injury, and a return to contact sports can be expected after three months, depending on the severity of the original sprain. If in doubt, please call (+65) 6471 2674 (24 Hour) to check your thumb sprain today.